A major part of my lipstick collection is reds. I feel glamorous, pretty and just fierce when I where a red lip so naturally I've got quite a few. 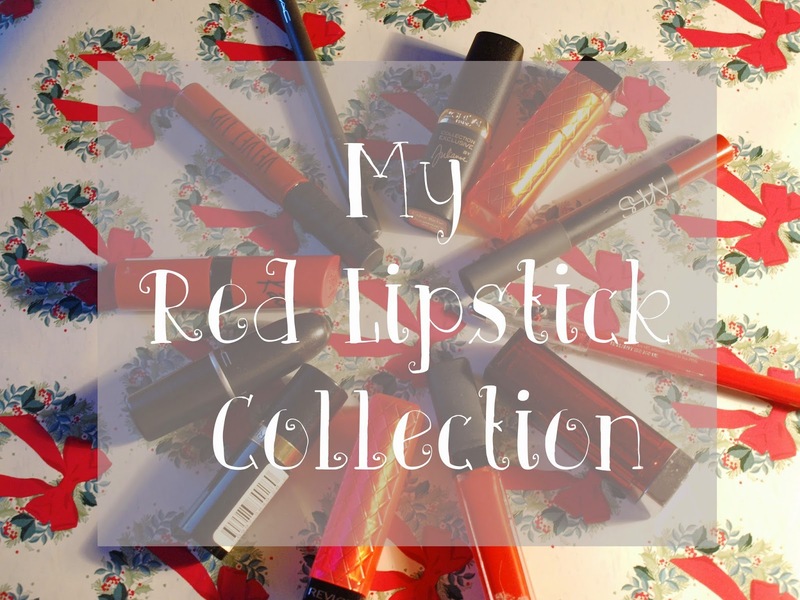 I have most of them here, one of my favourites (Revlon Really Red) isn't as I lost it but as for that, here is a mini review of each of them. Unfortunately with winter light I couldn't get swatches in day time, however here are a quick swatch. My favourite type of lipstick is matte, so most of them are matte but I also suit a blue toned red more than orange toned. Detail: A glossy red that applies with a dofer applicator. Pros: Packed with pigment, good if you like gloss. Con: A little messy and doesn't last very long on the lips. MUA Lip liner - "Red Drama"
Detail: A very affordable red lip liner. Con: Very creamy formula so doesn't last as long as other lip liners. Maybelline coloursensational lipstick - "Hollywood Red"
Detail: A slightly matte formula, more daytime than night. Con: None really - a great lipstick but might not suit everyone if you want a proper red. Con: More expensive, sometimes the lid 'pops' as if to come off. Revlon lip butter - "Wild Watermelon"
Detail: A sheer, moisturising red lip butter. Revlon lip butter - "Candy Apple"
Detail: A moisturising lip butter. Con: Pretty much exactly the same as Wild Watermelon, if you have one you do not need the other. Revlon lipstick - "Cherry Blossom"
Detail: A glossy, true red lipstick. Con: Doesn't last a long time, can be patchy if you don't blot. MAC lipstick - "Ruby Woo"
Con: A little more expensive, VERY drying, sometimes it feels you are more dragging on the lips so not good if you have chapped or dry lips. L'oreal collection exclusive - "Julianne's Red"
Detail: A very wearable daytime red, great for pale skin. MAC Lip liner - "High Energy"
Con: Quite expensive, you could really just get "ozone" by Urban Decay which is clear and use it with many lipsticks. Rimmel Kate Moss - "107"
Detail: Famous in the bloggersphere for being a great berry colour. Topshop velvet lips - "Velveteen Ribbon"
Con: I don't like this, very messy to apply, strange feeling on lips, doesn't last long. And there are all my mini reviews! If you'd like any in more detail, leave a comment and I'll happily do it with swatches aswell. What do you think of these lipsticks?